Paul Lovens has played in many duo constellation, with Paul Lytton, Urs Voerkel, Cecil Taylor, Mats Gustafsson, Paul Rutherford, Eugene Chadbourne.... Each of these duos is special-since these constellation correspond to Lovens' wide awake, microscopically precise, radically spontaneous attitude toward improvisation. As tonally sensitive as he plays his drum set, as musically sensitive as he interacts with his colleagues, for over 30 years, he still is able to play free of cliches. He "does his thing" without being egomaniacal. This special duo constellation rests in this freedom of cliches. Although the music is occasionally incredibly dense and present, it can hardly be fixed. Is it energy powerplay? Finely linked sound research? Post Free Jazz? English School? Is that a kind of duet for percussion instruments? Or electro-acoustic music par excellence? Is it what one expects? Or something completely different? 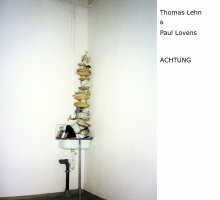 Lehn and Lovens know, in any case, how to surprise us-in the logical sense of the word! Because, when someone suddenly calls out "Achtung!" [Look out!] that doesn't mean by a long shot that we are prepared for what will come.